We’ve started something new and fun in The Cut Shoppe Scrap Spot Facebook Group!! Each month a different Design Team member will host a challenge, and I’m kicking things off this month with a Go Big or Go Home Challenge (use a cut file in a large way on your project). 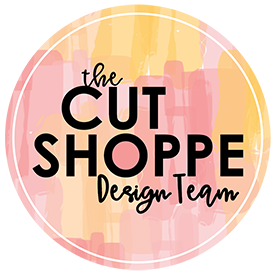 It’s simple to enter the challenge…all you have to do is create a NEW project that fits this month’s theme and you have to use at least one cut file from The Cut Shoppe (it can be from the Etsy Store or a freebie that you’ve picked up from the TCS Blog). After you’ve created your project be sure that you head to TCS FACEBOOK GROUP and upload your project in the August Designer Challenge comments. You have until August 31 at 8:00 AM CST to upload your project. One person will be drawn at random and will win 5 FREE cut files from The Cut Shoppe! I used the Full Circle Cut File and sized it to 10.5″ in Cricut Design Space. I cut the circle on white cardstock, but knew I wanted to alter the color. So before I removed the circle from the Cutting Mat I grabbed a few acrylic paints, including Dylusions Periwinkle and a few others from my stash. While the cut file was still on the cutting mat, I used a Rubber Brayer and added multiple layers of paint until I got the right color combination. I love how it turned out…it matches the periwinkle color in the Pinkfresh Studio Simple & Sweet Collection perfectly!! Now you can take a look at my Process Video to see how this layout came together! Thanks so much for spending part of your day with me & remember you have until August 31 to get your project uploaded in The Cut Shoppe Scrap Spot Facebook Group! We can’t wait to see what you create! I’m obsessed with this layout! It’s gorgeous!!! Thank you so much, Lydia!! Periwinkle blue is my new favorite color and I think I have this Pinkfresh Collection to thank! HA!